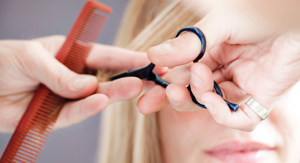 Home » Haircuts For Fine Hair » The Challenge: Stylists For Fine Hair! Need a Stylist for your Fine Hair? If you have fine hair, finding a stylist or salon to give you the very best haircut for your fine hair can be a huge decision! A salon professional may be fabulous at what they do, but knowing how to cut, style, condition and nurture fine, thin hair is a highly specific skill set. Here are a few tips to help you find the right stylist for your fine hair. Referrals are the #1 way to find the perfect stylist for your hair type…and not from someone you know! If you see a woman on the train, in the grocery store, or at your kids’ school and she’s got the same type of fine, thin or straight hair as yours but is sporting the look you want, just walk up and ask her. Just tell her you love her haircut (no need to mention that you think she has find hair, though!) and ask her if she’d be willing to share where she got it. Worst she can say? No. Best case scenario? You found the stylist of your dreams! Most women are flattered and willing to share their stylist. When barbers were the order of the day, you used to hear people say “Pick the barber with the worst haircut. Remember, they cut each others hair!” That same lesson may be just as true today, particularly if you’re in an area that has smaller salons. If you’re walking in or just trying on a salon for size the first time, take a few minutes and look around. Stick with the winners – the salons that not only sell, but specialize in and use products with a proven track record. For example, Redken is just one brand has a fabulous line of hair care products for fine hair. There are salons that sell nothing but, and their stylists are experts in using their products. Experienced and skilled Redken-trained stylists like Danielle O’Hara of Allure Salon in Glens Falls NY provide an amazing service for women with fine thin hair! The benefit to you? Training and knowledge…you are more likely to get a highly skilled stylist who knows all the latest in everything from coloring fine hair, to the ins and outs of hair extensions in a salon that promotes only the best products. Finding the right stylist can be a bit tricky, but have courage! The tips above are a good start, but – yes – trial and error reigns supreme if you’re going to find the perfect salon for you. The best thing about our fine, thin hair is that it does grows back, often quite quickly, so don’t be too upset if it isn’t exact the right cut…you’ll get there! Browse our site for ideas, tips, and quality salon products for fine hair that really can make a difference. Contact us for more information or to place your ad on this site!